But isn’t the wish for a Nutcracker kid-disturbance free like wanting Christmas without the tree? As an adult I still see the ballet at least once yearly because my inner five year old attended his first Nutcracker and was floored by how Sharon and Tamara, the two Pittsburgh Ballet Theater dancers who lived next door (and occasionally smuggled him cookies), could jump so high and twist themselves into and out of so many knots. And the adult comes because, for Balanchine, the ballet is all about that tree that grows to such a height the top, is finally cropped from view. Its proportions remind us that Balanchine intends Act II to be a critique of Act I. The ballet does not end with Marie waking from a dream but with her and the prince heading, in the words of C.S. Lewis, further up and further in. How could she go back to the Stahlbaum’s stuffy bourgeois parlor where Charlie Brown adults speak words that make no sense, but whose tones always mean no and shouldn’t and don’t. And so, yes, the young were the story of the Thursday night opening of Miami City Ballet’s Nutcracker at the Arsht Center as the audience crowded in with children and young teens flanked by parents. The moment was tense when St. Theresa’s Catholic School in Coral Gables seized the entire row in front of mine. Then Elena Romero, mom to one of the fourth graders, first cautioned the girls to be “quiet, quiet, quiet” during the performance and then explained to a very grateful me that she and her daughter had been coming every year since she was three. And the young were the center of attention on stage as well as the ballet opened to the famous scene of the Stahlbaum’s 19th century Christmas party and a room teeming with children, young dancers from the Miami City Ballet School. Girls in frilly dresses skipped and teased while boys in military-style jackets and pants played leapfrog and marched in formation. The children’s movements made quick counterpoint to the slow andante of the adults’ broad gestures as they mimed conversations or cocked an imperious head at the boys to settle down. Act I is about pantomiming family. Here MCB’s Carlos Guerra and Callie Manning, as Dr. and Frau Stahlbaum, shaped that all-important illusion of togetherness in the midst of a crowd with stage children, Fritz and Marie, played by student dancers, Ilona Halloran and Tuscany Bramwell. Bramwell, especially, was charming as Marie with the right mix of self-absorption and outgoing energy evident when she bonded with her just mended nutcracker toy. A highlight of Act I was Shimon Ito who, in green infantry coat and white pants, burst into life as the toy soldier with a quick succession of sharp heel-toe steps and knee-high jumps that gave the impression he really did have a coiled spring inside. Happily Ito returned later as an equally impressive Chinese dancer with tight leaps so precise they seemed to toy with the piccolo trills. 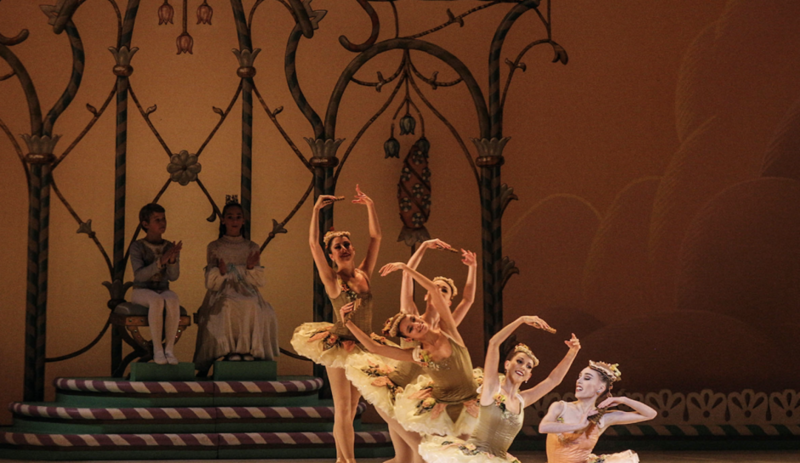 Act II opened to Tricia Albertson in the role of Sugar Plum Fairy overseeing a court of MCB students dressed as little (yes, adorable) angels in parchment colored, bell shaped dresses. The whole ballet is a must-see if only to experience how MCB’s lighting folks have contrived to bathe the marzipan court in such a dense, rich, lemony-peach light. And then add how Albertson’s jumps, slow turns and deliberate light steps so reflected the strike and fade of the celesta through the arch and point of her foot and the bend and stretch of her leg that the melody, usually dead from familiarity, rang out fresh and free. Nathalia Arja shone as Dew Drop in pale pink tights and a sheer skirt that allowed us to read her precise take on the waltz tempo in torso and turn of the hip. The French horn and oboe line leapt out of the melody as she balanced in arabesque and made small backward hops. The Dance of the Flowers was the finest company dance of the evening with flawless spacing and line, all 14 dancers entering into and exiting from simple changes of posture and weight as one. Balanchine once wrote about American young people and ballet, “The new generation will be the future citizens of the United States. …We have to do something for their souls and minds.” Miami City Ballet’s 2015 production of the Nutcracker opens that childhood escape hatch where the line between imagined and real vanishes and, as adults, we are freed to feel that bit of soul Balanchine set in motion in our much younger selves.